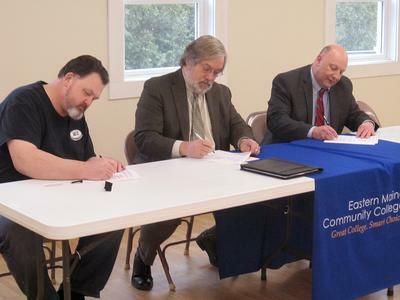 Alan White, left, president of the Island Employees Cooperative, signs an agreement with James McGowan, state director for Maine Quality Center, and Lawrence Barrettt, president of Eastern Maine Community College. The agreement will bring about 90 hours of business training to the members and employees of the cooperative’s three island businesses. Members of the Island Employee Cooperative got an early Christmas present last week, one that will help them in their new role as business owners. The cooperative signed a memorandum of agreement with Maine Quality Centers and Eastern Maine Community College which will provide more than 90 hours of customized training to the owner/employees of three island businesses. Maine Quality Centers, a program of the community college system in Maine, has provided a $15,000 grant to EMCC which developed a training program designed especially for the employee cooperative. The IEC formed last summer when the employees purchased three island businesses—The Galley in Deer Isle, Burnt Cove Market and V&S Variety and Pharmacy in Stonington—from longtime owners Vernon and Sandra Seile. IEC has 42 member/owners and, with 65 employees, is the largest employee-owned cooperative in the state and the second largest in New England. White noted that while their first six months as owners have been successful, they all need the kind of training the grant will provide in order make the transition from employees to owners. IEC members are looking forward to that training. Shauna Schmidt, another board member who is also a pharmacy technician, said she hopes to learn more about providing good customer service and about how to make that transition between being a manager and a worker and how to balance those two different roles. “I want to learn more about customer service and also how to be a better board member,” she said. White signed the memorandum December 12 at Burnt Cove Market along with Lawrence Barrett, president of EMCC, and James McGowan, the state director for Maine Quality Centers. Barrett noted that he had worked in a grocery store similar to the island market when he was younger, adding that it felt good to be able to do something that would support small business and keep jobs in rural communities like Deer Isle and Stonington. McGowan noted that Maine Quality Centers usually works with employers to train their workers. This project is a little different in that the workers are the employers, he said, but added that the program fits perfectly with what the IEC is trying to do. “We’ve identified about 90 hours of training that will build on what they already know about the business,” he said. According to Matt McLaughlin, the coordinator of business and industry at EMMC, the training will focus on developing skills in customer service, retail performance, business ownership culture, financial management and business management techniques in a program that was designed especially for the IEC. The training will take place in three sessions in Stonington. The first session in January will target supervisor and management training. “We’ll work on the role of supervisors and effective management techniques in a small business environment,” he said. “We’ll look at professional management of employees and business communications.” In March, during the college break, TJ Holloway, a faculty member in EMCC’s business management department, will spend a week with IEC members working on more general business management concepts as well as customer service. In May, they will tie it all together in one final session. The goal, McLaughlin said, is to provide the training IEC members need in order to become effective business owners.